They had only been under the instruction of George Watts and Bob McCourt for a year when six fledgling pipers, clad in black slacks and white shirts, made their piping debut at a Jersey Shore Irish American Club Dance in May, 1985. The entertainment was a success and the performance became the cornerstone of the ambitious and ever-growing pipe band. Within a year the newly formed band numbered fifteen talented and eager-to-learn musicians. In June, 1987, pipers and drummers, wearing kilts donated and formerly worn by the West Point Cadet Pipe and Drum Band, demonstrated their proficiency at the Garden State Arts Center Irish Festival for the first time. Throughout the following year, the pipers and drummers entertained enthusiastic spectators at parades, festivals and weddings. Their goal was to raise funds for the purchase of their own uniforms. In 1988, the musicians decided that forever more their band would be known as St. Brendan the Navigator Pipes and Drums. The pipers and drummers had a lot to be proud of. They had met their goal and were donned in full dress Lindsay tartans when they made their second appearance at the Garden State Arts Center Irish Festival that year. 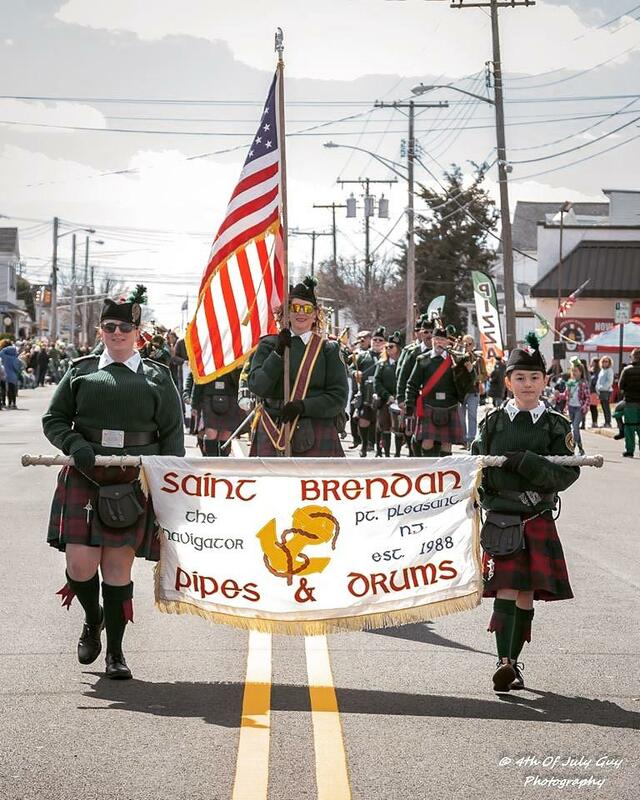 The members of St. Brendan the Navigator Pipes and Drums pride themselves in their promotion of the music and culture of their celtic heritage and in the band’s past, present and future goals and achievements. Of all Irish saints, Brendan was the greatest traveler. He was born near Tralee, Co. Kerry, an event reputedly marked by angels hovering in a bright light over the house. He was baptized by Bishop Erc, who ensured that a year later Brendan was delivered into the care of Saint Ita at Killeedy. At the age of six Brendan returned to Erc, who undertook his education for several years before indulging the boy’s desire to travel and study under other holy men. Erc asked only that he could perform his pupil’s ordination as a priest, and Brendan duly returned for this ceremony. Among the Irish saints Brendan visited were Finnian of Clonard, Enda of Aran and Jarlath of Tuam. From an early age Brendan attracted disciples, and he established a number of monasteries in Ireland. The most famous was Clonfert, Co. Galway, which was founded around 560, towards the end of the saint’s life. Clonfert became one of Ireland’s greatest monastic schools and endured until the sixteenth century. Today, Saint Brendan’s Cathedral in Clonfert is noted for its magnificent Romanesque doorway. Brendan also founded a convent at Annaghdown, Co. Galway, over which his sister Brig presided. Many landmarks of western Ireland are named after the saint, including Mount Brandon in Co. Kerry. Brendan is associated with a number of monastic sites close to the River Shannon and around the west coast of Ireland. In addition, he voyaged to Scotland, founding a monastery on Arran and visiting other islands. He is said to have met Saint Columba on Hynba Island in Scotland, and even to have gone to Brittany with Saint Malo, a Welsh monk. He may also have stayed at Llancarfan, the Welsh monastery founded by Saint Cadoc. Brendan’s reputation as a traveler rests, however, on the Navigatio Sancti Brendani, an account written by an Irish monk in the ninth or tenth century. More than 100 medieval Latin manuscripts of this Voyage of Saint Brendan still exist, and there are versions in Middle English, French, German, Italian, Flemish and other languages. The story has been much embroidered from its original factual basis and it is impossible to separate fact and fancy. However, an epic modern voyage led by Tim Severin in the 1970s showed that it was possible to sail a coracle of wood and leather to America, and consequently that Irish monks might indeed have preceded Christopher Columbus by several centuries. On the 3200-foot high summit of Mount Brandon are the ruins of a small beehive-shaped chapel commanding views of up to 100 miles in distance. There, it is said, the saint had a vision of the Promised Land. (There are, incidentally, many recorded accounts of the sighting of an island, a mirage usually identified as the fabled Hy-Brasil, off the west coast of Ireland.) Brendan’s first attempt to sail to the Promised Land was apparently unsuccessful, but he was not discouraged. He and his crew of monks prayed and fasted for forty days, and set off on a second voyage which lasted seven years and probably took them to Iceland, Greenland and even the American mainland. The Navigatio Sancti Brendani describes meetings with Saint Patrick and Judas Iscariot, the latter clinging to a rock during a temporary release from Hell. The saint celebrates Easter on the back of a whale, and escapes a predatory sea-cat as big as a horse. It is a work in the tradition of Homer’s Odyssey, and draws on Celtic mythology as well as classical sources and the Scriptures. Many medieval cartographers included Brendan’s island on their maps. In later life Brendan returned to his work in Ireland and died there in 578 at Annaghdown.